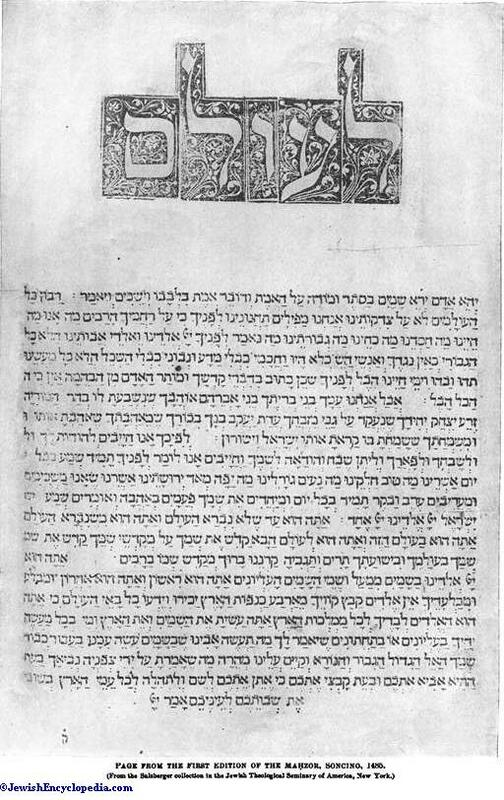 Page from the First Edition of the Maḥzor, Soncino, 1485. Russian painter; born at Wilkowiszk, government of Suwalki, Russian Poland, Feb. 4, 1860. After attending the schools of painting in Warsaw and Wilna he entered, in 1880, the Academy of Fine Arts at St. Petersburg; in 1881 he was awarded a silver medal for a painting from life, and in 1883 was graduated. At the exhibitions of the academy in 1884 and 1885 he was again awarded silver medals. In 1885 and 1886 Maimon executed portraits of the daughter of General Minkevitz and of the son of Baron Ungern von Sternberg. In October of the latter year he was awarded a gold medal by the academy for his "St. Irene Cures St. Sebastian," and for his "Ivan the Terrible Taking Orders Before His Death from the Metropolitan" the title of "Artist of the First Degree" was conferred upon him. He painted many portraits, among them those of the czar, czarina, the three princes, and Prof. Daniel Chwolson (1900; St. Petersburg Artists' Exhibition). His paintings include: "The House-Cleaner," "The Wagons at the Market-Place," "An Applicant," and "The Politicians" (exhibited 1889 and 1891; these represent chiefly peasant types); "He Lost His Way," "An Old Man," "A Girl's Head," and "The Fishers" ("Blanc et Noir" exhibition of 1891); "A Corner in the Theater," "In the Kitchen," "Buying Groceries," and "Repairing His Property" (academy exhibition of 1892); "A Cheap Restaurant" (St. Petersburg Art Exhibition of 1892); "The Maranos" (1893; Academy of Fine Arts); "The Mushroom-Seller," "A Girl Student," and "The Peasant Elder" (St. Petersburg Artists' Exhibition of 1894); "The Invitation," "The Broken Heart " (1895); "A Prayer in the Woods," "The Bouquet Fading Away," "The Southern Girl," "The Servant-Girl," "An Old Man" (1896); "A Woman's Head" (St. Petersburg Exhibition, 1899, held in the palace of Baron Shtiglitz). 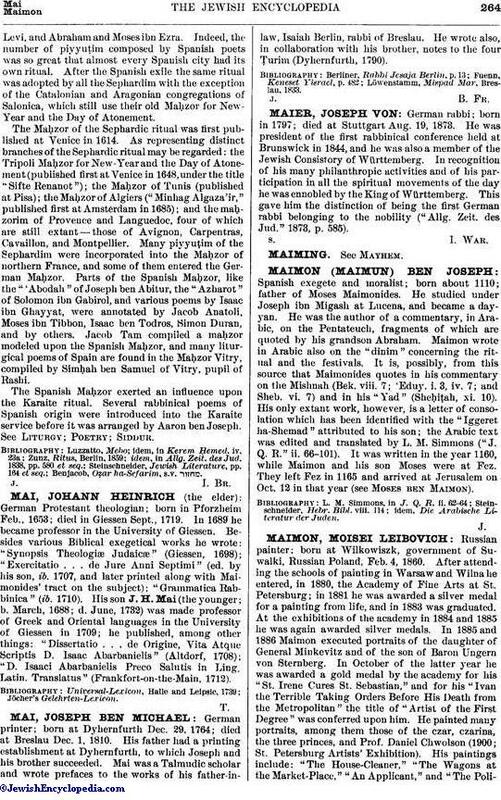 Maimon attained also considerable success in caricature. In 1900 he published two albums, one containing ten portraits of women, and the other ten portraits of men, all of persons mentioned in the Bible; some of these were copies from works of the great masters. "The Maranos" represents a Passover night in a rich Marano home. The family is seated at the table, at the head of which an old man, clothed in white, is reading from the Haggadah. The door opens suddenly and a masked and armed force of the Inquisition enters. The family is horror-stricken, with the exception of the old man, who continues to read quietly, with his hand on the arm of the chair, and by his attitude seeming to say: "I will finish my reading and then I shall be ready." For this painting he was made "Academician and Titular-Rath." 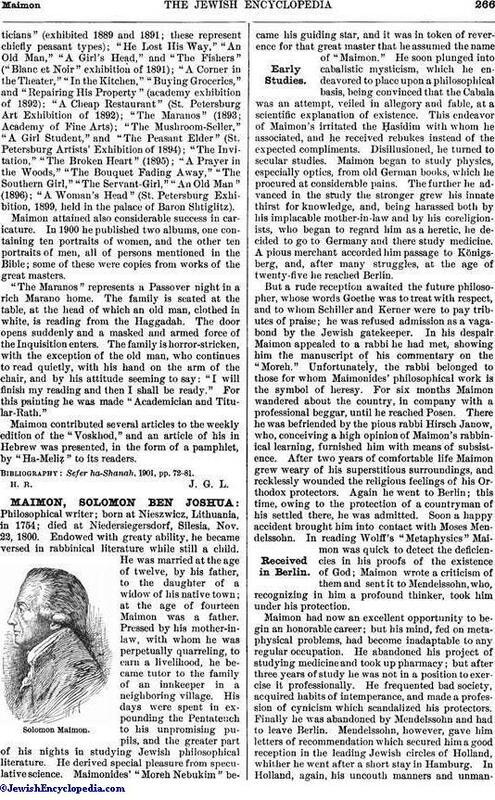 Maimon contributed several articles to the weekly edition of the "Voskhod," and an article of his in Hebrew was presented, in the form of a pamphlet, by "Ha-Meliẓ" to its readers. 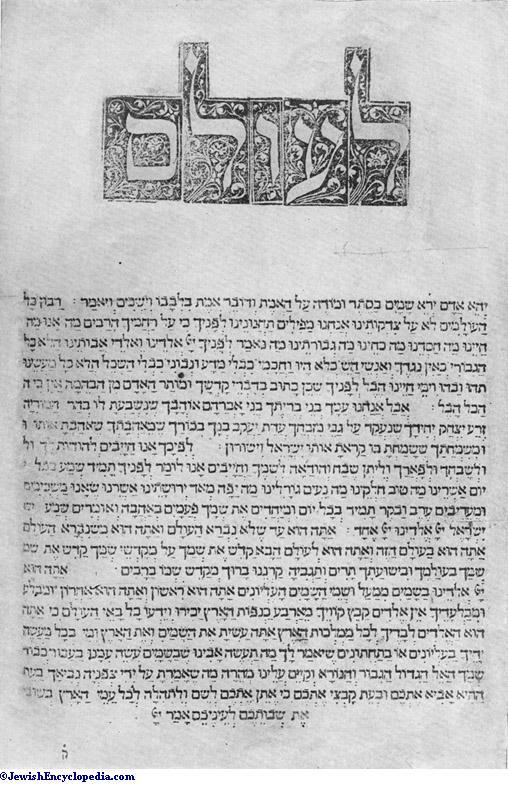 Sefer ha-Shanah, 1901, pp. 72-81.